Jock Stein was not only one of the most successful football managers ever produced in Scotland, he achieved it with local talent and not with a large cheque book. He started out as a player with lowly Albion Rovers in Coatbridge and continued to work as a miner during the week, while playing as centre-half on Saturday. He was signed up by Celtic in 1951 as a reserve but injuries incurred by first team players resulted in him being elevated to the first team. His leadership qualities were began to emerge and he became captain and led the team to a League and Scottish Cup double in 1954 - a rare event for the team in those days. An ankle injury later meant that his playing days came to an end prematurely and he took on the job of coaching Celtic's reserves. 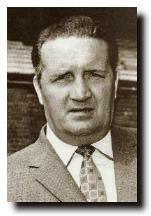 In 1960 he became manager of of Dunfermline at a time when the team needed six consecutive wins to avoid being relegated - and he achieved this impossible task. The following year Dunfermline won the Scottish Cup - the first major trophy in the club's history. In 1964 Stein moved to Hibs and galvanised that team too.